About four months ago I embraced the idea of a daily uniform as a means to help me stay found and serve as my physical compass to maintain a path toward equality. A daily uniform doesn’t just have to be about limiting decision-making to free up cognitive space. In recent years/months articles have been published about creative directors, tech CEOs and great minds of the past opting trim down their wardrobes to a collection of items that are similar and easy to grab-and-go. That is not me (although, I’d like to think my mind is somewhat great…time will tell). I have not switched to a standard daily uniform to limit the cognitive noise, I did so to spark and broaden daily conversations about a very important topic: equality. First, let’s explore the idea of a personal compass. Over the years I’ve delivered, refined, delivered and refined my concept of a personal compass. I am not the only person who believes in the idea of a moral compass, but I choose not to include the aspect of morality. I simply call it a personal compass. At one point in my life I was an avid outdoorsman. I lived in Fresno, CA and had three National Parks in my backyard (Sequoia, Yosemite and Kings Canyon). I spent a year hiking and climbing in Colorado when I was in my early 20s. And I’ve taken off for the wilderness for times of isolation and reflection. As an adult, I have never gotten lost, because I know how to use a compass. To this day, while I often confuse my left from my right, I can generally identify north, south, east and west without a problem. A compass is all about alignment and bearings. A personal compass is no different. So what do we align? What bearings are important? There are four elements I use when discussing a personal compass: head, mouth, heart and feet. Looking at various scenarios we face on a daily basis, these four elements are subject to alignment, misalignment and realignment. When backpacking, it is helpful to regularly check your bearings to determine if you are staying on course or wandering to far off the path. The personal compass works the same way. The reason I use the head, mouth, heart and feet is because they exist on the body in a vertical line. We start off aligned. We start off true. We start off on course. All we need to do is to make sure we like the path we are on and make incremental adjustment along the way (course corrections). Back to the uniform, the impact it has on my personal compass and the idea of equality. While I was recently traveling in Australia, Adidas released the Supercolor line, which was endorsed/inspired by the musical artist Pharrell. Let me make it very clear: I am not a sneakerhead. In fact, this was the first time I’ve worn Adidas since I rocked a pair of Patrick Ewings back in the late 80s. Why were the Supercolors different? 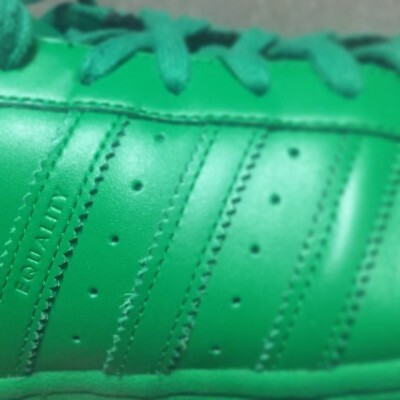 Well, Adidas produced fifty different monochromatic colors. That is ambitious and cool. I am a huge fan of the color orange and instantly wanted to own a pair of orange Supercolors. I tracked down an Adidas Originals store in Melbourne so I could buy a pair. The other cool thing was that Adidas chose Australia for the global release of this product and we happened to be in Australia at the time. That was part of the hype for me, and seemed like a cool souvenir to grab. I found an orange pair and then took a closer look. Then things changed. Each pair of Supercolors has the word “equality” stamped on the side (think of letterpress on a shoe). Equality. I currently live in St. Louis, MO and the idea of equality has been top of mind for the community, country and world since the death of Michael Brown in Ferguson. Even before that tragic event, inequality was fully evident in a region like St. Louis. Then with the amazing decision by the Supreme Court, equality for the LGBTQ community took a huge step forward. But what does that have to do with Adidas or Pharrell? I can’t simply throw on some shoes and but “Happy” on repeat. But I can check my compass and make a course correction in my own life. About two months ago I developed a plan. I wanted equality to be a driving force in everything that I did, thought, felt and said. While, everything might be a bit unrealistic, I wanted to allow equality to remain present. I also wanted a mechanism to bring the topic of equality into more and more aspects of my life. Get rid of all my clothes and scale back to a simple uniform. My chosen uniform ended up consisting of jeans and a black shirt (button up, polo or t-shirt). On my feet would be a pair of Adidas Supercolor sneakers. On my feet, on my foundation, would be the word equality. I ended up buying seven pair of shoes to complete the ROY G BIV spectrum. The shoes get noticed and people always like to talk about them. That allows me to naturally talk about equality. More importantly, the shoes can serve as a visual reminder to check my personal compass. Am I approaching situations and challenges with thoughts of equality? Am I using a lens of equality when I am planning and problem solving? Policy comes from the head, and as a leader of an organization, do I create policies that are foster equality? What do I say to people or about people? What terminology and messaging am I spewing? Does equality roll off my tongue with authenticity and conviction? Social media, public speaking, or simple conversations should reflect equality. How do I feel when I witness inequality? Does my heart break? When power is balanced, does that warm my heart? Does equality feel right? Do I create situations for others to feel like the tables are set equally? What actions am I taking to drive equality to deeper levels within my sphere of influence? What does the path of equality look like from a purpose and a direction standpoint? Setting a true north is often a challenge; so if you are wondering what your true north should be, look around at where you want to go…or where you want to lead people. Where do you want to arrive? I chose to work on arriving at a place where equality was the reality for more people. I have a limited sphere of influence, but want to leverage what I have to stay found. We’ve taken a few significant steps forward, but we need to maintain alignment. Check those bearing and stay on course.